The new garages are…over 30 years old!?! Consider yourself somewhat fortunate if you had the privilege to see first-hand the old garages that stood at the Indianapolis Motor Speedway until 1985. The iconic green and white barn doors defined Gasoline Alley for many decades, including what most consider the “golden age” of Indianapolis. But as we approach the much talked about milestone of the 100th Indianapolis 500 in May 2016, we are also coming upon another milestone that is perhaps being mildly overlooked. Thirty years ago, the old Gasoline Alley garage area was torn down without much commiseration. A few months later, after the land was cleared, a new, modern facility was erected in its place. By the time teams and spectators arrived for the month of May 1986, a new concrete canyon of 96 garages units was receiving its finishing touches. The garage area in 1984, a little over a year before it was demolished. The “Gasoline Alley” opening is in nearly the same location as it is today. The two banks of garages ran east-west, and used to straddle the Gasoline Alley corridor. the Tower Terrace grandstands (yellow back seats) were torn down after the 1998 race, and eventually replaced by the Pit Terrace. The “Gasoline Alley” garage area dates back to the very early years. The location of the garage area is mostly in the same location as it has been since the beginning. The term “Gasoline Alley” goes back to the 1920s, and originally referred to a location in the back corner where cars would refuel. Later on, the name was loosely adopted for the east-west main corridor of the garage area complex. Eventually the term was simply used colloquially for the entire garage complex. A peek inside Al Unser, Sr.’s garage in 1984. Notice the green & white “barn” doors, and rather crammed quarters. between them was, as mentioned, clearly defined as Gasoline Alley. The decade of the Thirties, known for the Great Depression, and the “stock” formula adopted at Indy (just don’t call it the “Junk” formula!) was also known for Tom Beall’s Diner. It was set up in the southwest corner of the garages, just inside the fence near the pits. It was THE gathering place for the month of May (and in some years the month of April too). Drivers, crews, and anyone involved hung out at the diner, many of whom ran up a tab for weeks…promising of course to pay it off when the race winnings were handed out after the race. On the morning of the 1941 race, a fire broke out in the garage housing the car of George Barringer. The car (the ahead-of-its-time, rear-engined machine) was being refueled with gasoline. In a nearby garage, the car of Joel Thorne was being worked on with a welder. The gasoline fumes caught fire, and quickly spread. Barringer’s car, located near the end of the south bank of garages, was destroyed in the blaze. Every other qualified car was spared, as the teams quickly wheeled them out of harm’s way to the pit area. About a third of the south bank of garage was burned to the ground. As many as two other cars were destroyed, but they were not cars that had qualified for the race. In addition, a considerable amount of tools and other equipment was lost. Firefighters reportedly had difficulty arriving on the scene due to the heavy race day traffic. After a delay of about an hour or two, and with no one seriously hurt, the race was run as normal. A few images are available online of the fire, here is one of the blaze still smoldering, and another of the aftermath. It is at this point which I have been looking for some clarity on what happened to the garage area. Ultimately, the garage area was rebuilt, but it was unclear exactly when, and to what extent. There is very little written about it, but the 1942 race was indeed scheduled for May 30, 1942. Ticket order forms were mailed out in November 1941, and once upon a time, one of those order forms was put up for sale on eBay. NI500CC has an image of a 1942 ticket proof, and they are extremely rare to find. The United States was thrust into World War II after the attack at Pearl Harbor on December 7, 1941. 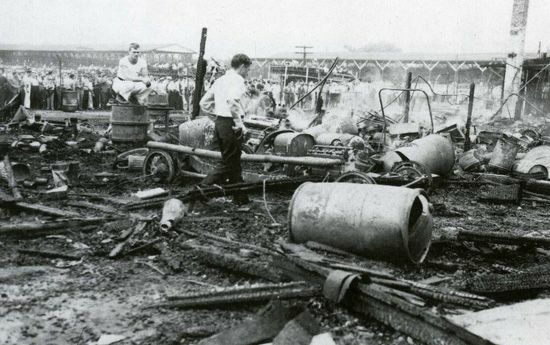 Speedway President Eddie Rickenbacker officially cancelled the 1942 race (and all subsequent runnings for the duration of the war). As we all know, the track was immediately shuttered for the next four years, and left to rot into a state is disrepair. I had not been able to find a definitive answer on the specific status of the garages at that juncture until very recently. Over the summer of 1941, although the hostilities were escalating abroad, the United States was still not involved in the war. Speedway management was moving along preparing for a 1942 race. Plans were drafted in July 1941 to rebuild the garage area, although it is unclear if these plans called for a complete demolition of both existing banks, or simply the south bank singly. It is fairly clear that the garage area was rebuilt in the late summer and early fall of 1941, just weeks before the track shuttered. Therefore, the new garages sat unused for over four years awaiting the resumption of the race in 1946. There are only few photos of the facility during the war, and probably none taken specifically in the garage area. It was mentioned in the newspaper at the time that the garages built in 1941 kept up well and survived the war years and apparently did not need any significant attention during the clean up leading to the 1946 race. Gasoline Alley entrance, ca. 1985 The USAC office is visible on the right. As the 1950s and 1960s ushered in a golden era of roadsters, and later the rear-engined revolution, Gasoline Alley was the nerve center of this carnival of speed. The layout remained as two parallel, double-sided banks of garages, running east-west, with the “Gasoline Alley” corridor running up the middle. Interestingly enough, there was a time when there were not enough stalls for the number of entries. During practice some of the smaller teams were crowded out, and presumably had to work out of a truck or a tent on the back side of the complex. As the years went by, the track added stalls to the end, extending it east until it finally topped 88 units in the early 1980s. Up through the 1960s, and perhaps into the 1970s, the corridors were not all paved. The main middle corridor seems to have been paved going back a long time, but the two outer lanes were said to have been gravel until a later time. Sam Posey did a rather fine piece about the old garage area (and the construction of the new garages) during the 1986 Indianapolis 500 Pole Day telecast on ABC Sports. Rather than retell the entire story, I’ll let him do the narration. It begins at approximately the 20:20 mark. The 1986 episode of Legends of the Brickyard showed some short footage of the construction of the new garage area. It begins at approximately the 2:18 mark. Lastly, a friend of mine happened to do a rather nice walk-through tour of the garage area in May of 1985 using his good old fashioned video camera. Knowing that it was going to be torn down, he took the time to show all around one last time. It is one of the only documentations of the last days of the garage area you might ever find on YouTube. It is a good look of the typical hustle and bustle on a qualifying day that went on in the garage area at the time. The narrow, jam-packed corridors, showed how the sport had literally outgrown the complex. The stalls were so small, some equipment had to be stored outside, creating further bottlenecks. No doubt anyone who was around at the time, misses the old garages, at least sentimentally. No question though it was time for an updated facility. It seems that not much was spared from the rubble, although numerous doors were kept and were collected. In fact, the doors were replaced from time to time anyway, as they would wear out, so there were quite a few out there already. Oddly enough, the Indianapolis Motor Speedway Hall of Fame Museum did little if anything to recognize the old garages for better than twenty years. I do not even recall a set of doors on display anywhere on property, although that’s not usual. The Speedway, while heavy on tradition, as Posey said in the clip above, is light on sentiment. When something gets removed or torn down, they usually leave no trace. It was not until about 2005 that they set up the mock garage stall in the museum. Now it is a popular static display, with a car from the 1950s or 1960s typically parked inside. They have a set of green and white doors on display now, definitely a nice touch. In hindsight, it is actually a bit of a shame that the time to rebuild the garages coincided with the early/mid-1980s. The architecture of the era was not exactly the most aesthetically pleasing. The goal was to make the garage complex ultra-modern, with vastly increased work space, improved amenities, widened ingress/egress lanes, and a long, durable lifespan. If those were in fact the published goals, they succeeded in all of them. At the age of 30, they are still as functional as ever, and they are not at all looking dilapidated. Far from it. The travel lanes are wide enough to drive the transporters up to the garage stalls, and the individual stalls are still big enough for the teams. The “new” garage area at the traditional Gasoline Alley entrance in 1993. At the time, the white overhead sign was still in place, the old press room building and Oldtimers Club building (red roof) was still standing. And the west side of the garage area complex featured a row of ancillary support garages (you can see the back of them directly behind the red roofed building). Both the old press room and the west bank of garages was demolished in 1999 during the construction leading up to the 2000 U.S. Grand Prix. One of the other quiet “goals” of the new garage complex was to take the opportunity to scale back the ‘Snake Pit’ inside turn one. By constructing the three banks of garages north-south (with the main Gasoline Alley corridor now at the north edge), the garages ate up a significant area that used to be for rowdy spectators and revelry. Couple that with the new motorhome row that was set up along the south side of the garages, the infield of turn one lost a good amount of real estate. It only mattered a little bit though, as the patrons had already began migrating to the infield of turn four, and establishing the ‘Snake Pit II’ up there. The main problem with the new garages, however, was the lack of visual appeal. Going from the quaint, nostalgic barn doors to a bare concrete canyon was a striking change. The terms “plain” and “antiseptic” come to mind. But that was the style then. We were still at the tail end of the dreaded cookie-cutter era of multi-purpose stadiums (for baseball & football), and the IMS garages fit right in with that style. Plain, unpainted, pre-cast concrete, set up with bland, gray garage doors, bland gray-painted floors, no windows (except tiny windows on the passage doors), and an even more cavernous and hollow-looking interior. The vast interior space allowed the teams the luxury of setting up their equipment as they pleased, and eventually several stalls began to sport checkered tile floors or something similar. Some teams put up dividers, and some even set up a break room complete with carpeting, couches, and perhaps a kitchen area. The Garage Area at the “traditional” Gasoline Alley entrnace in June 2016 during the SVRA Brickyard Invitational weekend. The overhead sign is no longer present, and the two-story “Legends Row” hospitality rooms (built in 2000) replace where the old press room used to stand. The Alley Cats typically set up their area near the staircase leading to the second floor of the Legends Row building. About six years later, Camden Yards in Baltimore opened, changing the landscape and attitudes of architecture in the sports world. Major League Baseball teams began constructing “retro” ballparks (or renovating their existing stadium to conform to the style). Football teams began building gridiron-specific facilities, and as we moved into the 21st century, one by one, nearly all of the dreaded concrete cookie-cutters had been torn down (or were slated to close). While MLB and NFL were building spectacular edifices of superior form and function (and NBA & NHL were doing the same with their indoor arenas), Gasoline Alley at Indianapolis seems to have been left behind, bare concrete and all. It was just unfortunate timing. The race track construction boom of the 1990s further magnified Gasoline Alley’s dull façade. A number of new speedways popped up around the country, each going in new directions to improve their garage designs, to make them not only increasingly functional, but aesthetically pleasing, and now more than ever, fan-friendly. When the United States Grand Prix was added to the calendar at Indianapolis, part of the requirements to achieve proper FIA grade 1 status was to construct pitside F1 garages. After the 1998 season, the Speedway demolished most of the Tower Terrace (yellow back seats). By 2000, a new expanse of pitside garages (complete with suites and seating above) was completed along the south half of the mainstretch. While these garages had to be built to specific FIA specifications, there was enough latitude to give them at least some aesthetic charm. The Garage Area in 2016. The two-story “Legends Row” hospitality rooms (built in 2000) are now located along the west side of the garage area. The rarely-photographed southwest entrance gate is also visible. The southwest entrance is sometimes locked and not utilized, and never has been formally marked or decorated. those at most race tracks across the country. At the same time, they are lacking in visual appeal, and fan amenities. Back in the early 1980s, Mid-Ohio Sports Car Course was purchased by Jim Trueman, and he built a garage area that was years ahead of its time. There are three two-story building, with the garages on the first floor. A staircase leads to a pedestrian-only second floor, which doubles as an observation catwalk. The first floor garage is open to the second floor ceiling, allowing spectators to look down into the garage stall from above and observe the crews working. During the track activity, that second floor also offers a view of the start/finish straight and pit area. When Daytona International Speedway renovated their garage area in the mid-2000s, they came up with a design which allowed patrons without credentials the ability to still observe the inner workings of the garages. The garages are set up in a somewhat of a “V”, with the cars on the outside perimeter, and the spectators on the inside. A wall divides the actual garage from a grassy spectator “courtyard” in the middle. Windows line the wall, allowing the spectators a nearly full view of the crews working. Similar concepts have been used at other tracks as well. The back gate viewed from inside the garage area complex. This frequently seen, but rarely photographed view is looking east towards the track medical center. The row of hospitality motorhomes is just to the right of this view. The fence opening (walk-through gate) on the right of the picture was added in the late 1990s or early 2000s. Safety Patrol members often keep the drive-through gate closed, and pedestrians are directed to enter through the newer side opening. Note that the back gate sign was and is only single-sided – the sign at the traditional entrance was double-sided. As far as age, most people who have been around long enough still refer to the current complex as the “new garages.” Although at over thirty years old, it is getting harder and harder to use that vernacular. Of the 33 drivers in the field for the 2015 race, sixteen of them were not even born yet when they tore down the old garages, and another 7-8 of them were young enough at the time they probably would have little or no first-hand recollection of them. Fewer than ten of the drivers are probably old enough to have been around to see the green & white barn doors, yet none of them would have been old enough (age 18) in 1985 to have been allowed in. Alex Tagliani was the oldest driver in the field in 2015, and he would have been 11 at the time. In 1985 and prior, the Gasoline Alley sign resembled a banner over the entrance (See slideshow photos). In 1986, coinciding with the new garage area, a new modern sign was installed over the entrance. A rectangular white sign with the IMS wing & wheel logo, and the words “Gasoline Alley” was located at the traditional gate. A nearly identical sign was installed at the back gate (now in the southeast corner of the complex), except it said “Garage Area.” The wing & wheel logo depicted on both signs was the long-used 1960s-2008 logo. It should be noted that the sign at the traditional entrance was double-sided. The sign at the back gate was only single-sided. The 1986-1999 sign seen in 1997. Note the photographers’ catwalk bridge with the wing & wheel logo in foreground, suspended between the Tower Terrace grandstand sections. The catwalk would have been taken down after the 1998 races, while the white sign stayed up through at least the 1999 races. In 2000, when the new Pit Terrace and F1 garages were completed, the look of the Gasoline Alley entrance changed drastically. A video board was installed over the through-way. The new entrance appeared more closed than before, almost tunnel-like, although the corridor itself was mostly unaltered. In 2015, the original Daktronics video board was replaced with a larger 16:9 wide screen high-definition video board. The white overhead sign at the traditional Gasoline Alley entrance was removed at some point after 1999 or 2000. It was definitely gone by 2001. The “twin” sign located at the back gate near the hospital remained for several years longer. It appears to have been up through 2011. Despite the Speedway adopting a new retro-style logo for the Centennial Era (2009-2011), the back gate sign maintained the 1960s-2008 logo through the duration of the Centennial Era. In 2000, a new “Gasoline Alley” sign was affixed to the Pit Terrace overhang. One was situated on the outside (the traditional location facing east to the pits), and now one was also installed on the inside, facing the garage area (facing west). The first such sign was blue with yellow lettering. A small IMS logo was in the upper left corner, and a silhouetted image of a checkered flag waving was on the backdrop. This appears to have been a temporary sign, as finishing touches were still being made to the new F1 garages, the Pagoda, and other related construction. In 2001, a newer, larger Gasoline Alley sign replaced the small one from 2000. It was blue with yellow lettering, and checkers behind the lettering. This sign was used through 2008. In 2009, the Gasoline Alley sign was replaced with a new one, matching the color scheme for the Centennial Era celebrations. This sign remained in place from 2009-2011. The colors were maroon and white, with the IMS Centennial Era logo flanking on each side. In 2012, at the traditional entrance, the Centennial Era style Gasoline Alley sign was removed (as mentioned, Centennial Era graphics were mostly retired from use during the summer of 2011), and replaced with a new one without any reference to the centennial era. It was a black and white sign, with bold black lettering, and two of the new IMS wing & wheel logos (one on each end). This sign appears to have been used in 2014 also. In 2013, the sign was a solid black sign, with white letters. The two IMS logos were on each side, but said “Gasoline Alley” in large letters, and “Indianapolis Motor Speedway” in small thin lettering. This sign was removed after only one year, and as mentioned above, the 2012 sign was reinstalled. In 2015, the sign was updated to a blue and black sign, with white lettering. On the left is a Sunoco sponsor logo, and on the right is an IMS logo. This sign was also in place for the 100th Indianapolis 500 in 2016, and as of 2017, still remains. The Sunoco logo, Gasoline Alley lettering, and IMS logo all internally illuminated, and can be lit up at night. As mentioned, the name “Gasoline Alley” was shared by a popular comic strip. At Universal Studios Island Of Adventure theme park in Orlando, Florida, there a souvenir gift shop that serves as an homage to the comic strip. At the “Toon Lagoon” section of the park, the Gasoline Alley shop features a colorful sign. In 1977, the Miller Pit Stop Contest was introduced as part of Carburation Day. At some point, a sign was hung listing the winners of the event. From left to right was a USAC logo, the Speedway wing & wheel logo, and the Miller sponsorship logo. The listing stated the year, the winner driver, the winning team, and the elapsed time of the winning pit stop of the final round. In the early 1980s, the sign was seen hanging on the side of one of the Gasoline Alley garage buildings. The south bank of garages held the USAC offices, and the Pit Stop Contest sign was hanging in the top middle, facing west. The original sign had a Miller High Life logo (the brand sponsor at the time), and had room to list winners from 1977 through 1986. New winners were painted on annually. The sign is visible in this 1985 photograph. After the old garages were torn down, the sign was relocated. Around 1986, it was hung on the back of the Tower Terrace grandstand, adjacent to the Gasoline Alley corridor. It was now facing east. In addition, since the old sign was poised to fill up after 1986, a new sign was made that added room to list winners through 2000. The updated version of the sign was likely installed sometime between 1986 and 1988. Based on various photos taken during off-season periods, it appears the Pit Stop Contest sign was taken down after the month of May concluded. This was presumably to protect it from harsh winter weather, and it would have been placed in safe keeping during the rest of the year. It is believed that it was not hanging up during Brickyard 400 weeks in 1994 and 1995. Spring 1995 Corvette pace car photo shoot. The newer version of the sign still featured the USAC logo on the left, and the wing & wheel logo in the middle, although it appears to be a slightly updated version. On the right, the Miller High Life logo was replaced with a Miller Genuine Draft logo, reflecting the shift in the branding sponsorship. After the 1995 race, Miller dropped their sponsorship of the event. From 1996-2002 the sponsor became Coors Brewing Company. Later Checkers/Rally’s (2003-2007), McDonald’s (2008), Izod (2010-2012), and TAG Heuer (2013-2017) have been the title sponsors. The Pit Stop Contest sign on race weekend of 1995. Note the winner is already listed only two days after the event had been held. This sign was taken down at some point after the 1995 month of May. With Coors as the new title sponsor of the event, the sign was updated once more. It is not clear when the newly-updated sign was re-installed, but it appears it was the same second sign with the top half covered over and replaced with new graphics. The USAC logo on the left was replaced with an Indy Racing League logo, the wheel & wing logo was moved to the right, and a new Coors event logo was placed in the middle. In addition, the title lettering was removed or covered up. It is not certain if this version of the sign was present in 1996 or 1997, but it was definitely there during the month of May 1998. After which time the Tower Terrace grandstand where it was hung was demolished. For 1999, a temporary grandstand was erected in its place, while preparations for the construction of the new F1 garages and Pit Terrace were underway. The current whereabouts of the old Pit Stop Contest sign are unknown. The Coors version of the Pit Stop Contest sign is visible in this 1998 photo. EDIT: This article was edited to include revised information about the rebuilding of the garage area in the summer of 1941 (12/07/2015). EDIT: This article was edited to include details about the new panel on the garage area back gate sign, and to add additional photographs (4/12/2017). EDIT: This article was edited to add a slideshow of general garage photos, particularly showing the lack of aesthetics. Additional minor edits (12/11/2017). EDIT: This article was edited to add information about the Pit Stop Contest Sign (3/20/2018). This article for further edited for additional information about the Pit Stop Contest Sign in 1998 (3/20/2018). EDIT: This article was edited to add information about the Gasoline Alley signs. (3/29/2018). EDIT: This article was edited to add information about the Gasoline Alley shop at Universal Studios. (4/24/2018). The entrance to Gasoline Alley was a busy place the day before the 500 in 1993.